Brick is a ceramic. Antique brick, when cut thin into tiles for flooring is essentially an unglazed ceramic tile, very similar to a Saltillo or terra cotta tile. Installation is the same- they are adhered to the floor using tile thin set, and then grouted. They can be grouted with a sanded tile grout, but many people will use a Mason’s mortar as a thin brick grout. Both products are a mix of Portland cement and aggregate, but the mason’s mortar will have a courser grind to the aggregate, which can give the installation a more authentic brick look. Some people will choose to use a sanded tile grout, especially if they are trying to get a specific color. Make sure the surface is clean and sound. You can install on any substrate that would work for other ceramic tile. Plywood, tile backerboard, cement board are all suitable. Snap chalk lines in a grid pattern to guide the install. A standard brick joint is 3/8”, but grout lines can be wider or narrower. We recommend a chalk line every 3rd row of bricks. You may want to change your grout with slightly to help avoid any awkward cuts on the edges of the installation. Install using acrylic modified thin set tile adhesive using a ¼” X ¼” notch trowel. The wider gauge of this notch trowel versus a 1/8” trowel will help to have create a bed that can make it easier to even up the tops of the bricks if there are slight thickness variances. Install just enough area at a time that you can lay the bricks within the mortars working time. Once the bricks are adhered, wait 24-48 hours before grouting. These sealers will decrease the porosity of the thin brick without putting any sheen on them whatsoever. They may slightly enhance the colors. “MIRACLESEAL® POROUS PLUS 511” is widely distributed. Although this will make the brick look the most natural, it will be more difficult to keep brick that is sealed this this category of sealers clean. There seem to be dozens of similar products of this type, you may find “Aqua Mix® Seal & Finish Low Sheen” but most of these water based acrylic Saltillo or terra cotta sealers seem to be similar. These sealers will put a low sheen, almost waxy type of finish over the brick tile. This is a type of finish that will wear off over time, especially in high traffic areas, so it may need to be reapplied every several seasons or so. But application is relatively easy, it just brushes or rolls on with a paint roller, and dries quickly, it is not much more difficult that mopping the floor. This is our recommended sealer for a tradeoff between the natural look of the brick and having a finish that is easier to maintain. 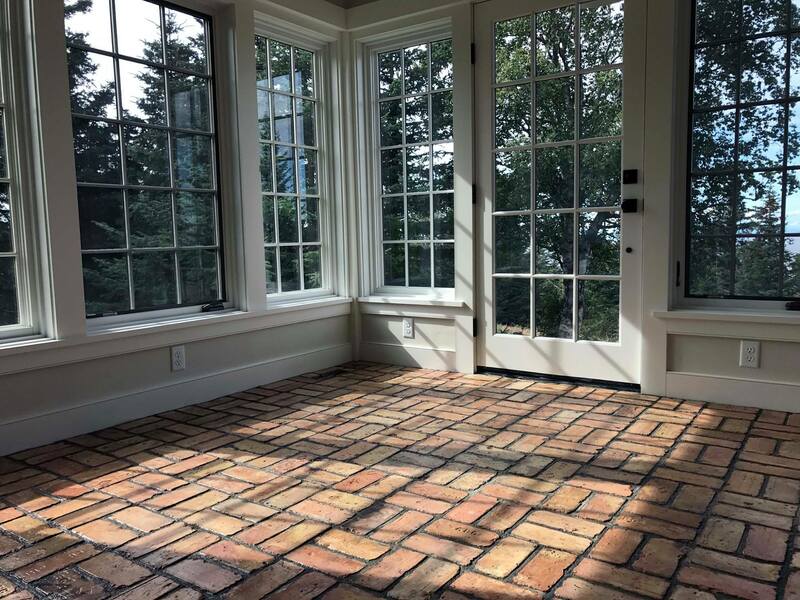 The highest gloss sealer that can be used on antique brick tile is an oil-based polyurethane such as Minwax® Fast-Drying Polyurethane or others. Although these sealers produce the highest level of protection and ease of care, they do darken and change the look of the brick into a high gloss, wet look finish. If you are going to seal with a penetrating sealer or water-based acrylic, apply a coat or two of sealer to the tops of the brick prior to grouting. This will make it a lot easier to get the mortar clean from the tops of the bricks. The best way to do this is to roll it on with a paint roller, as this will make it easier to keep the sealer out of the grout lines, where the presence of the sealer will work against adhering the mortar in the joints. A brush can be useful to seal the bricks around the margins. If you are using a oil based polyurethane, skip this pre-sealing step but you will have to work extra hard to clean the brick after grouting, and consider cleaning the surface of the installed, grouted brick with muriatic acid to remove haze and etch the brick for best adhesion of the poly. Most installations are grouted using MASON’S MORTAR which is sold either pre-mixed such as QUIKRETE® MORTAR Type N or you can make your own mortar by mixing one-part Portland cement with three parts sand. Sanded tile grout may also be used for grouting, these are similar products, the only difference is that sanded grout has a finer grind to the aggregate compared to a mortar, and colorant is added. Grouting can be done using either a grout bag, by pushing mortar into the joints with a grout float. Once the grout is in the joints, sponge the joints and the bricks to remove excess mortar and clean the bricks, changing the water frequently. Get the tile as clean as possible in the first go around, because once the tile is dry, if there is a grout haze, it can be difficult to remove. If you are using a penetrating sealer or water-based acrylic, once the grout is dry, you can apply the sealer over the entire installation. For a polyurethane, see the instructions below. Roll the sealer over the installation with a heavy knap paint roller, using a brush on the margins. Apply up to 3-4 coats, the first ones will soak up much more than the last ones. These sealers may need to be reapplied every several seasons or so. Polyurethane sealers will darken the look of the brick considerably. If you decide to go with this type of finish, you are best to not pre-seal the brick with any type of grout release (this can affect the adhesion of the polyurethane), so great care must be taken to get the tile as clean as possible manually when grouting. Use a clean grout sponge and change your water frequently. Some sealer manufacturers recommend etching the brick floor by treating with a muriatic acid solution. Since polyurethane does not breath, all moisture must be out of the installation before applying the finish. This means waiting up to 3-4 weeks between grouting and sealing. In the meantime, foot traffic is O.K., but precautions should be taken to keep the floor clean during this time. If a polyurethane is applied before all moisture is out of the brick, water and salts can migrate to the top of the brick and get trapped between the surface and the polyurethane, clouding the finish. Also, oil-based polyurethane is quite noxious stuff, turn off pilot lights and plan to be out of the building while the poly dries and cures. We recommend 3-4 coats, the good news is this type of a finish can last over a decade before the floor needs further sealing.